Two months of summer holidays and lazy days have come to an abrupt end, and regrettably as of today it is back to early mornings, preparing school lunches, and routine to our day. The time has flown by, whatever happened to January? I do have a new project on the go. From all green to all fabrics pink and girly. These log cabins blocks measure 12.5 inches and are destined for a quilt for niece who will be turning 6 shortly. She is definitely an all pink girl. So very very cute! Love the white centres on each block. Ahhhh....Pink, my favorite color!! She will just love it! Lovin the Pinks..I'm sure your Neice will love it. Oh, how my 3 1/2-year-old granddaughter would LOVE this quilt. Ooh, now that's a color choice that gets my heart pumpin' ! Love it ! Beautiful work, as always ! So fun! I love monochromatic quilts! Yes, please - I love the pink! So many pretty fabrics! You KNOW I love pink. I am just catching my breath now. Those blocks are so very pretty. They are beautiful. You know, I'm not a pink girly person, but I absolutely LOVE these! OHHH! Those colors made my mouth water. Beautiful yummy fabrics will be loved. Love, love, love the log cabins - I'm sure it's going to be another beautiful quilt. Ohh I love all those pinks! Perfect for a girly girl! Lovely:) The white center makes this quilt. 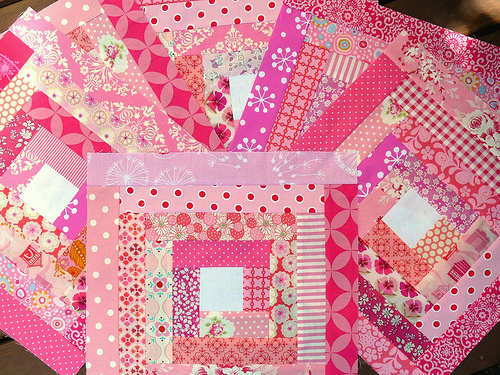 My 4 yr old keeps wishing the the quilt I started 2 yrs ago (when I was a strong anti-pink mom) had more pink in it (now that I've given in to the pinkness my girls want). 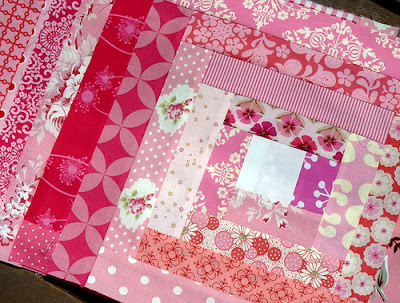 I hadn't started the border, so now there is pink in the border AND there will be a pink binding. But.... Wouldn't I like to make her an all pink quilt too? All this to say, this quilt would be dearly loved at our house too. all pink is right!! super cute! Yes indeedie back to school lunches again...what a drag. Nothing like a nice quilt to take your mind off it! V-nice! That is going to be gorgeous - she'll love it! All the best for the year ahead...I know it feels like we are right into here! Full steam ahead. Very pretty - the white centers give it a fresh pop. Your blocks always look so crisp - do you use starch, press a lot, what? YUM! Those look like perfect choices for an all pink girl!!! You can't go wrong with pink! It looks great! Your niece is very lucky. It's delicious; any 6 year old (or any age really) girl's dream come through! Loooove the new quilt behind your blog header, totally inspirational design!! These squares will make a beautiful quilt for your niece. I am playing around with the log cabin design--the squares are really fun to make! I love reading your blog. Oh I adore those pink log cabins. Beautiful. Inspiring. these log cabins are beautiful! Some times routine is a good thing, though, isn't it?